I Moved to Linden Avenue! A blossoming linden tree. 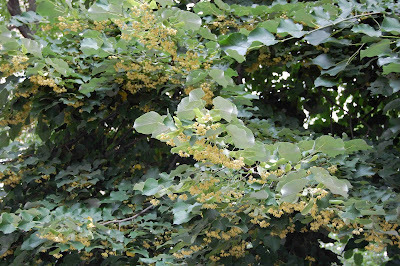 I'm pasting below a blog I wrote a few years ago about linden trees and flowers. Click the photo to enlarge. The American linden tree, Tilia americana, is also called basswood, lime tree, white wood, and bee tree. This blog is normally about wildlife, but I'm taking a moment to praise the linden trees that are blossoming in New York right now. In a city not noted for smelling good, the event is a delightful occasion. Linden tress smell fresh, green, flowery, and sweet -- a little like melon, a little like honey. The smell wafts hauntingly around the trees and spreads on warm breezes. It makes me stop and inhale. 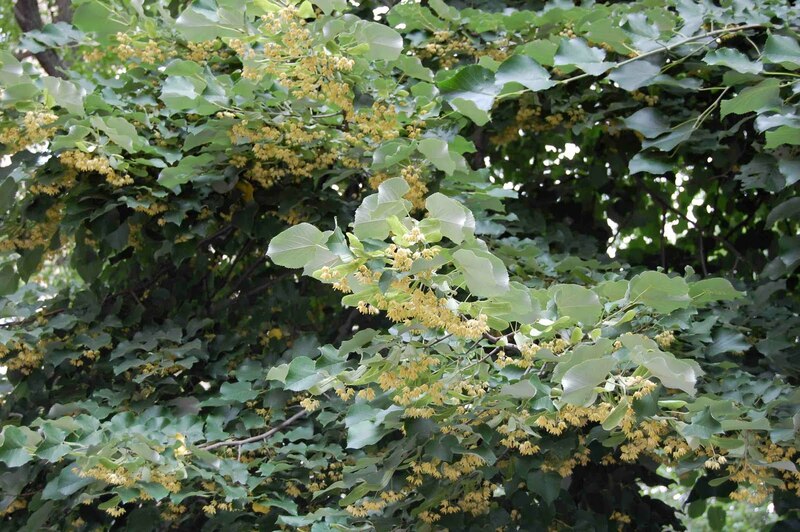 It smells so good that I look forward to passing each linden on my daily route, especially a big old tree on the northeast corer of Central Park West at 66th Street; its flower-covered branches droop over the sidewalk and diffuse perfume all around. Lindens are native to eastern North America. They are common in cities, suburbs, and forests, so a lot of places smell good right now. Closely related trees, also called lindens, grow throughout the Northern hemisphere. They are prized for their beauty. Their wood is especially valued by carvers -- linden wood decorates the great cathedrals of Europe. 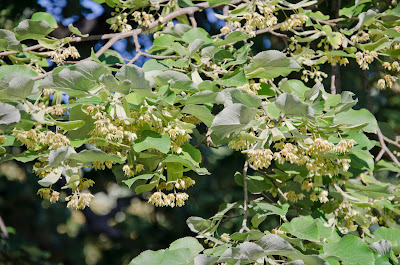 Linden leaves and flowers are used for perfumes and teas. Honey made from linden flowers has a light minty herbal taste that is renowned among honeys. Aromatherapists use linden to "calm and relax the body and the mind." We could use more of that. We should plant more lindens. I wrote a few other posts about linden trees after this one in past Junes. Click here. Or here. I really like linden trees. Then a funny linden-related thing happened. You'll see in the right hand side bar section "about me" that I added a June 2018 update. In short, I retired and moved out of New York City. I'm now living about 15 minutes from Center City Philadelphia, so there will be no lack of urban wildlife to discover. I am also close to the New Jersey Pine Barrens, which is full of interesting things. But the cool thing is -- I moved to a street called Linden Avenue, and when the leaves on the winter street trees opened in spring I realized that the tree in front of my new home is a linden! And each of my close neighbors has a huge spreading linden out front, too. There are more up and down the block and they are all blooming right now so the air here is sweet with the smell of linden flowers -- fresh, green, flowery and sweet. Like honey, melon, and limes. Ahhh. Chincoteague wild ponies. Click to enlarge. "The heart of a father is the masterpiece of nature." 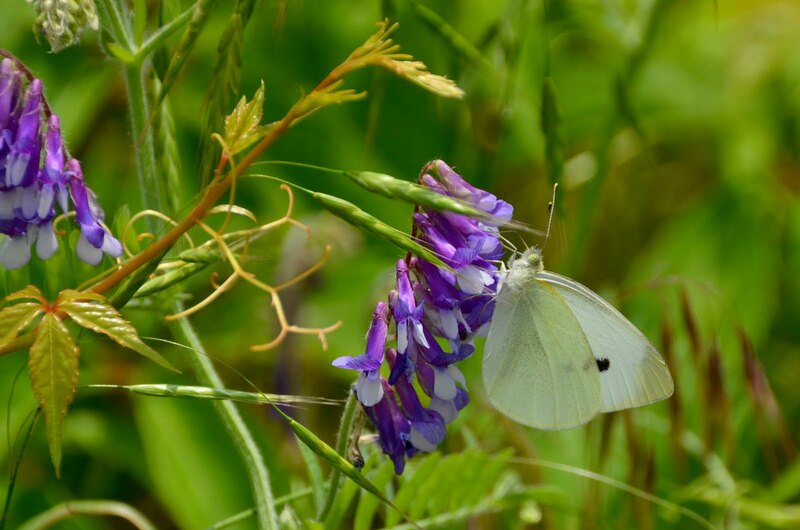 A cabbage white butterfly on vetch flowers. Click to enlarge. of June trembled like a butterfly. 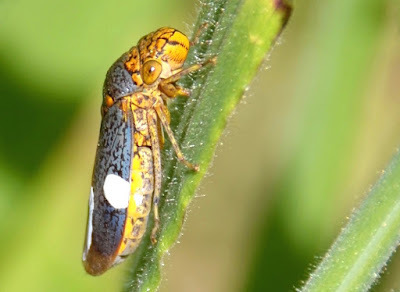 Meet the Broad-headed Sharpshooter, Oncometopia orbona. Click to enlarge. This large leaf hopper is called broad-headed for obvious reasons. There are a couple of competing stories about why it is called a sharpshooter. Maybe it is because it can defend itself by spitting a liquid stream of waste at an adversary, causing a diversion while making its getaway. Then again, it might be named for the magnificence of its accurate bullet-like long distance leaping powers. OR it just might be its stealthy way of disappearing like a military sharpshooter, tiptoeing to hide behind a tree to avoid detection when approached. I played a game of hide and seek with this one while trying to photograph her from behind or above. Every time I moved, she moved deftly to the opposite side of the stem and then froze, giving the impression she was tiptoeing -- or should I say tip-tarsus-ing? I say her, because what I noticed first about this bug was the bright white wings patches. Female sharpshooters of some species produce this stuff and then store it on their wings until they lay eggs. Then they scrape it off their wings to apply a protective coating to the eggs.